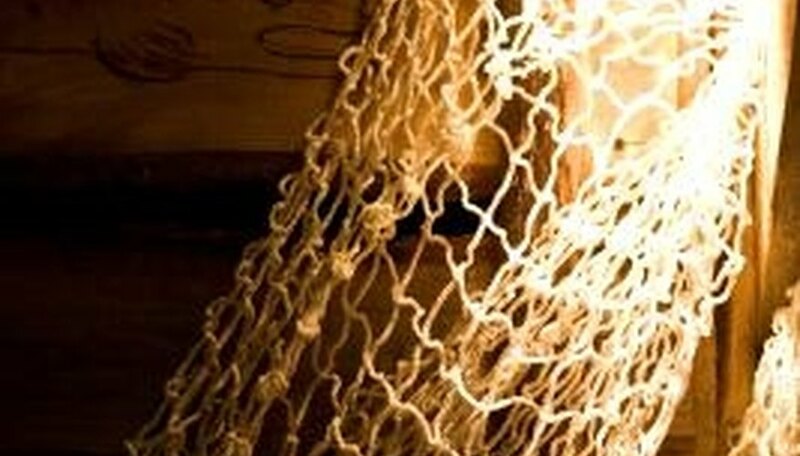 A fishing net should be mended immediately when a hole cuts through it. Holes can be caused by fish, fish picks and sharp-edged rocks, which most fishermen encounter while fishing. Frequent tangling also causes damage and tears on nets. How you will repair and mend a torn fishing net depends entirely on the extent of the tear. The task could require a simple and methodical way of knotting or some skills and techniques applied in sewing. Cut off fibers from the loose tag ends along the torn areas of the fishing net using a pair of scissors. Check the knots that join at least three of the strands in the mesh. Test the knots to ensure the still are strong and intact. Cut some strands of twine or string using your scissors. The length of each strand will depend on where you will use it on the mesh, whether to attach to a loose tag end or at the intersection of a knot joining three other strands. Lift each hanging loose tag end and tie to a precut strand. Attach the other end of the strand to the opposite side of the fishing net if it is just a simple cut or tear. Use a square knot. Move from right to left until you are through with the line. Knot a strand of string on three unbroken strands around the hole in the fishing net. Use the needle to loop and knot these strands to the other side of the fishing hole. Make sure that your mending is done in an even and symmetrical fashion to match the existing mesh design and dimensions of your fishing net. Dan Falk has been writing professionally since 2008. He was an editor for the "Daily Nebraskan," his university's local newspaper, and is an accomplished writer for the sketch comedy group 3Bettys. Dan graduated from the University of Nebraska at Lincoln where he majored in English and filmmaking.